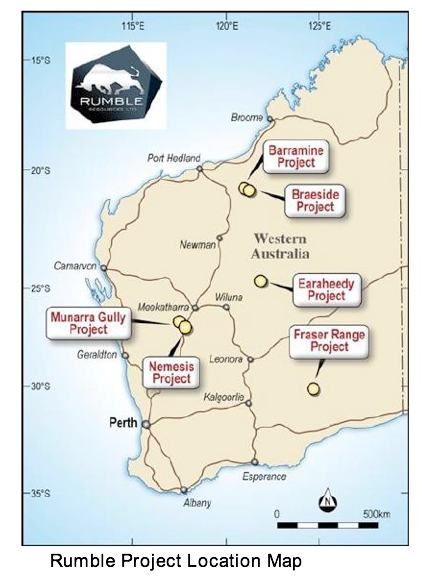 Rumble Resources Ltd (ASX:RTR) has today updated the market on its planned 2018 exploration programs across its four projects — Braeside, Munarra Gully, Nemesis and Earaheedy projects, all of which are on track to be drilled tested in the coming months. Given the prospective nature of all four projects, each drill program offers the chance for RTR to make high grade discoveries. It should be noted that RTR is an early stage company and investors should seek professional financial advice if considering this stock for their portfolio. During 2017, RTR completed the first ever modern systematic exploration at the Braeside project which included soil sampling (regional and infill), Heli-VTEM and prospect geological mapping with grab sampling which generated thirteen (13) targets that were subsequently tested by nineteen (19) first pass reconnaissance RC drill holes. Now, the company has commenced geological mapping and detailed sampling aimed at generating drill targets. 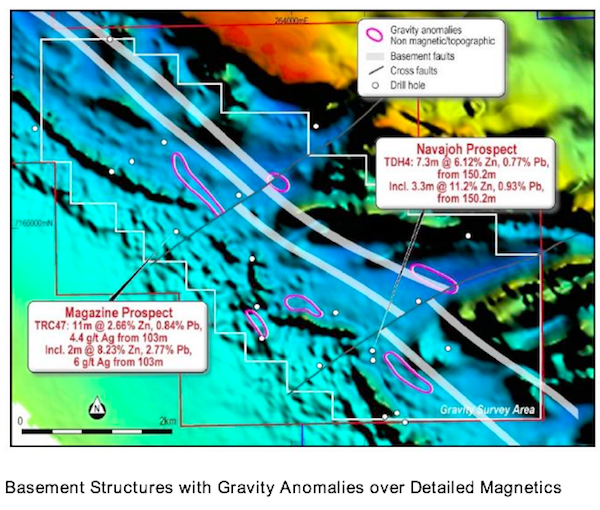 This includes follow up of the new Devon Cut high-grade zinc discovery and delineating new high order drill targets. The first drill program at Braeside for 2018 is on track to commence in late May. Fieldwork is planned for later this month, with detailed geochemistry (soil and grab sampling) and geological mapping to generate drill targets. 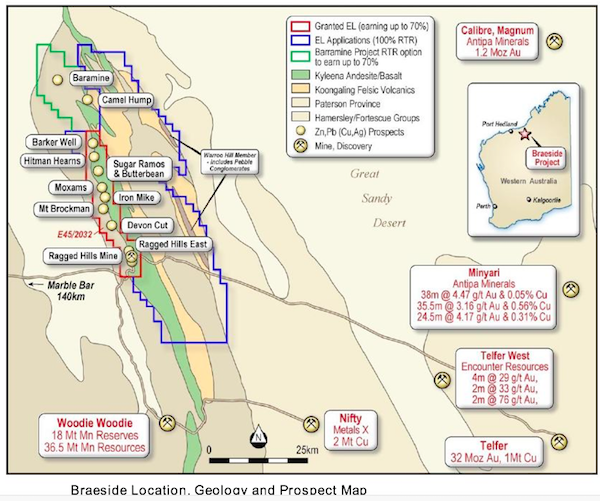 Numerous high-grade targets have been identified at the Braeside Project from infill soil and rock chip sampling within E45/2032 and remain untested, which will be the focus for new drill target generation. Following the RC drilling program schedule for May, RTR will undertake a diamond drill program to follow up significant mineralisation. 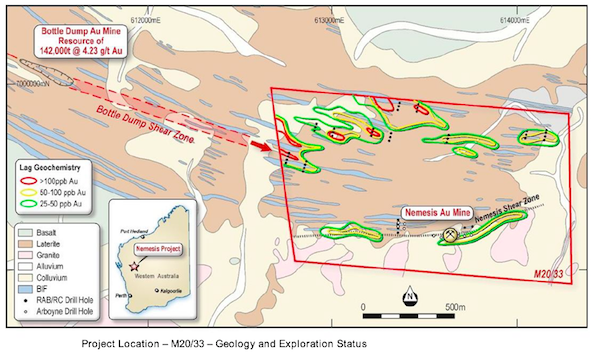 At Munarra Gully, RTR is targeting a highly prospective ultramafic intrusion with significant copper gold mineralisation and elevated nickel-cobalt. 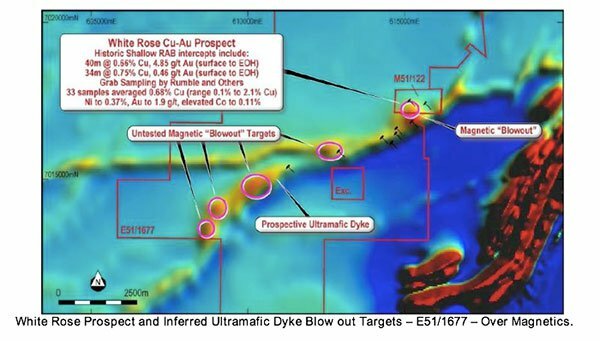 The initial target is the White Rose Prospect located near and around the two open cuts where shallow historic RAB drilling has defined exceptional copper-gold mineralisation that is completely open along strike and at depth. Orientation soil sampling has been completed over magnetic features at Munarra Gully, and RTR has commenced ground TEM (transient electromagnetic) traverses over the White Rose prospect, in particular targeting semi to massive copper/nickel sulphide conductors which cover the historic exceptional drilling results. In addition, RTR plans to commence RC drilling this month at the White Rose Prospect. It has already completed an orientation soil program over the ‘blow out’ targets, and is awaiting results. The Nemesis Project hosts the historic workings at the Nemesis gold mine, which were worked to a maximum depth of 70 metres with three steep plunging high-grade gold (average grade of 98 g/t gold) shoots (85° to the east) over a strike length of 60 metres. RTR’s has commenced mapping and analysis to determine the plunge extent of the historic high-grade gold mine, with a look to generating drill targets. It plans to start drilling at Nemesis in late April. Broad spaced drilling (completed in the 1990s) at the Earaheedy project defined several prospects containing oxidised and primary zinc-lead mineralisation (zinc dominant). This mineralisation was associated with a flat-lying “northeast dipping laterally continuous dolomite horizon with over 20 kilometres strike”. Partial leach soil sampling over gravity targets has been completed by RTR, consisting of 370 samples on 200m x 200m spacings to cover the gravity trends and anomalies with the aim to help delineate “base metal leakage haloes”. The company is now awaiting assays. Further, RTR has also submitted an EIS application, with RC and diamond drilling of gravity/structural high-grade zinc targets scheduled for July.